The Duomo in Milan is one of the largest churches in the world, and like so many cathedrals of this scale it took a long time to be completed, close to 800 years. 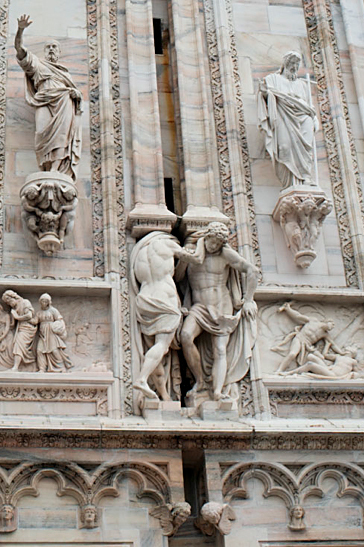 The sculptures on the facade came last, probably sometime in the early 1800’s. When I was there I saw an amazing pair of figures, which although I have seen the building before I had never noticed the detail in the drapery covering – or not – the figure on the right. It is an astonishing image for the front of a church. This entry was posted in Church, Italy and tagged Duomo, Italy, Statue on October 29, 2015 by joelmeyerowitz2014.